Applies a Butterworth bandpass filter optimized for narrow bandwidths to time series. 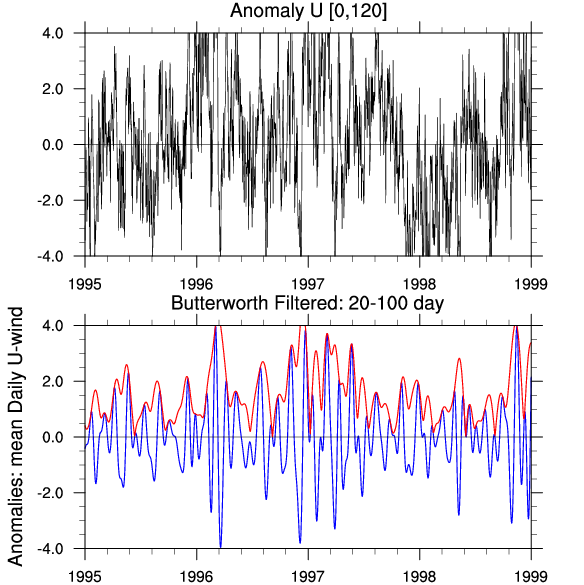 An array of time series to be filtered. Missing values are not allowed. A scalar indicating the cut-off frequency of the ideal band pass filter: (0.0 < fca < 0.5). A scalar indicating the cut-off frequency of the ideal band pass filter: (0.0 < fcb < 0.5) and (fcb > fca). opt@m - order of filter; 4 <= m <= 6 should be adequate for most applications. Currently, the maximum value allowed is 10. Default is 6.
opt@dt - a scalar specifying the sampling interval. Default is 1.0.
opt@remove_mean - a logical scalar whether to remove the mean. Default is True. opt@return_filtered - a logical scalar whether to return the filtered time series values. Default is True. opt@return_envelope - a logical scalar whether to return the envelope time series values. Default is False. The dimension(s) of x on which to apply the filter. Must be consecutive and monotonically increasing. If both opt@return_filtered and opt@return_envelope are True, the returned array will be of size (2,dimsizes(x)). Otherwise, if only one of opt@return_filtered or opt@return_envelope are True, the returned array will be of the same size and shape as x. The return type will be double if x is double, and float otherwise. The following is an edited description extracted from the underlying code. The bw_bandpass_filter executes a fast, stable zero phase Butterworth bandpass filter of order (m), which is optimized for narrow band. Stability of the method is achieved by reducing the bandpass filter calculations to simple cascaded first order filters, which are forward and reverse filtered for zero phase. The method also does a linear shift of a Butterworth lowpass filter to an equivalent bandpass, without going through a standard non-linear translation to bandpass. An option is included to remove the signal mean initially to compensate for large DC offsets. An advantage of the Butterworth bandpass filter is that there is no loss of data at the beginning and end. Example 1: Perform optimized Butterworth band pass (40-50 day) filter on daily data at a specific location. ua_bf@long_name = "Band Pass: "+cb+"-"+ca+" day"
Time series plots depicting the bandpass and associated envelope series for two different pass bands follow: TOP: the original time series; BOTTOM: the bandpass (blue) and the envelope series (red). Example 2: Perform optimized Butterworth band pass filter to a narrow band of daily data at multiple locations (grid points). ua_bf@long_name = "BW Bandpass: "+cb+"-"+ca+" day"
Plots depicting the spatial distribution of 40-50 day bandpass values at 5-day intervals spanning January 15, 1997 to February 19, 1997: Spatial distribution 40-50 day values. 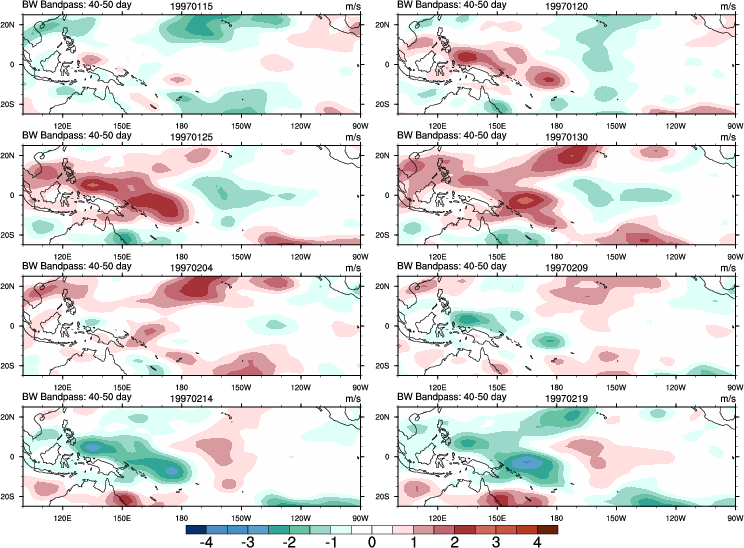 The Madden-Julian Oscillation (MJO) is clearly present.